SolarActive® is proud to introduce its SolarActive® line of UV color change systems. We CREATE AND DEVELOP UV color change systems for your specifications. SolarActive® offers UV color change systems in various forms of raw materials such as plastics, inks, threads and much more. 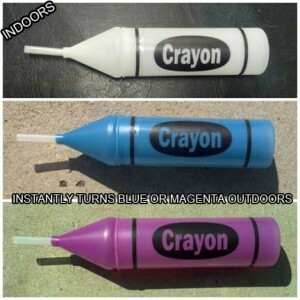 We develop materials such as EVA, PVC, PE, PP, etc to change colors in the UV / sunlight. SolarActive® supplies the pigments for use in your own ink systems to make the color change effect. SolarActive® UV color change systems are stabilized with Proprietary chemistry that allows the product to change colors over and over again. We offer 7 basic UV color change colors that start off clear and change to orange, red, yellow, blue, green, purple, magenta and can make many other color to color combinations in plastics. We have 28 basic UV color changing ink colors and those colors can be blended to create new colors for screenprinting on apparel, leather, paper and more. Available in Purple, Lavender-Blue, Violet, Yellow, Blue, Orange, Red, Green, Pink Aqua, Burgundy, Gold, Magenta and introducing our newest color – Black. Color to Color combinations blue to green, pink to purple, etc. Available in many compounds: PP, PE – high or low density, PU, PVC – soft or rigid, K Resin, EVA. ALL NEW! Color changing FLIP FLOPS! 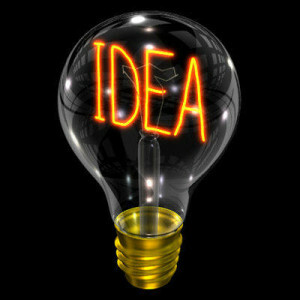 CALL OUR OFFICE NOW TO SEE IF YOUR ITEM OR IDEA CAN BE DEVELOPED TO CHANGE COLOR INSTANTLY POWERED BY THE SUN. NOW YOU DON’T SEE IT…NOW YOU DO! IT’S MAGIC! SolarActive UV color change screen print and transfer inks, transfers, and t shirts. SolarActive® is the world leader in UV color change screen print and transfer inks. All of our UV color changing inks meet all safety standards and are environmentally safe. Our vibrant UV color changing inks are proprietary and stabilized for continuous color change. SolarActive UV color change screen print and transfer inks and heat transfers used on tees. We sell color changing ink or we can print for you! SolarActive® UV color change plastics have incredible possibilities for a variety of applications. 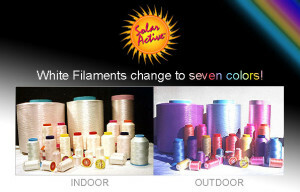 Using SolarActive® UV color change Master Batch creates colorful color changing plastic products. Our products are stable, bright and economically feasible. SolarActive offers the latest technology in UV color changing threads ideal for embroidery, monograms, and decorative designs! Great for home sewers and footwear & apparel manufacturers. 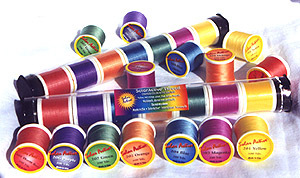 Threads are available in large bolts for manufacturing fabrics, socks etc. woven on circular knit machines. Seven basic white to color options, and 4 color to color options. All using the Proprietary SolarActive color changing technology. SolarActive UV color change systems have incredible possibilities for a variety of applications on plastics, paper, and fabrics. Hydrochromics is a popular water concept in UV color changing technology from SolarActive. The screened image is activated by water, not sunlight or heat. A white hydrochromic ink is screened or sprayed over an image. All you see is the white ink. When water is applied to the white ink, it disappears and the image behind it appears. When the water dries, the image goes back to white. 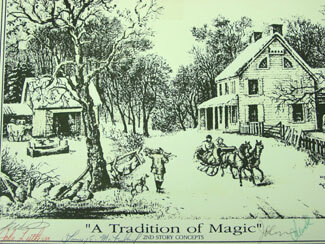 Hydrochromic ink is used on place mats, umbrellas, toys, paper, and more. Application: Used as screen printing ink or spray coating. Security Threads * ALL NEW! A new breakthrough in identifying counterfeit goods from SolarActive International, the company world famous for the unique SolarActive UV threads. 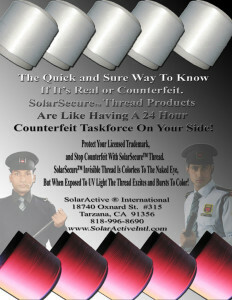 SolarSecure thread is now available for your trademarked apparel, footwear and accessories. SolarActive® International is your Promotional Products Supplier and Custom T-Shirt Printer. Utilizing our specialty SolarActive® Environmentally friendly inks, threads, and FDA approved plastics make your promotion stand above the rest.